The Big Island of Hawaii is, well… BIG! That’s what I love about it ~ it’s so diverse. We began our visit in the Hawaii Volcanoes National Park. It’s located on the Southeast side of the island which is usually damp and chilly. 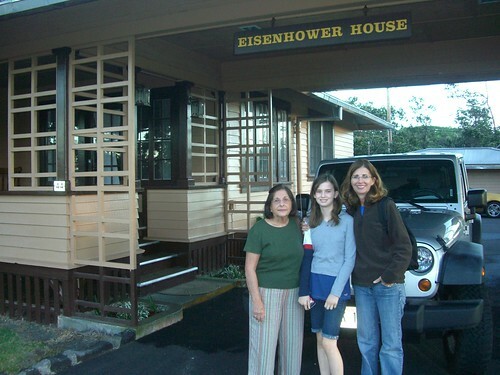 We’re stayed at the Kilauea Military Camp (KMC) which rents out cottages to military members and their Families. We splurged and rented the “Eisenhower House.” President Eisenhower stayed in this cottage in 1946 when he was General Eisenhower. It’s a beautiful house with two bedrooms, dining room, living room, full kitchen and two bathrooms. I could easily live here! As lovely as the cottage is, the best part is the proximity to Kilauea Volcano and all the sights to see in the Park. There is a lot to see in the Park and I highly recommend the hikes. Makes you feel like you’re on another planet sometimes ~ the vast, empty spaces that have been covered by lava. Well worth the trip to see it. The furniture in the cottage is beautiful! 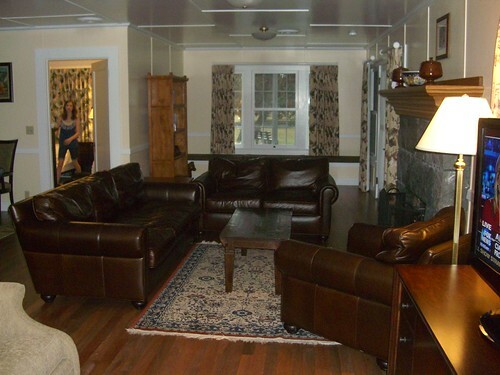 Thankfully, the decor is new items ~ mostly koa wood and leather. Just an interesting fact…..I and my parents stayed in this cottage back in 1977! My father was in the Air Force and he was stationed at Hickam AFB on Oahu. We lived in Foster Village on Molehu Drive. I remember watching the Aloha stadium being built. I believe they finished it in late 1975 but I could be off just a small amount. We lived there on Oahu from 1973-1975. It was a time that I will never forget. I remember going to the big island and staying at KMC. We did that several times. We also rented cabins at Bellows Beach Park Over by Sea Life Park. Not far from that park is where the Shiners’ house was that they filmed Magnum P.I. and I also remember seeing some of the filming of Hawaii Five-O. Believe it or not we stayed at the Iilkai hotel when we first arrived there in 1973. I remember that we came back to Hawaii from the mainland for a funeral back in 1976 and when we got into the taxi and the driver asked ‘which hotel’? My dad said, just take us to 1305 Molehu Drive. I will never forget that. This is just one happy memory. I remember the Hilton lagoon and the Arizona memorial. Hawaii is an extremely large military place. I remember that my father had a friend in the Navy and me and my parents took a dependant’s cruise on a fast frigate from the Naval Base at Pearl Harbor to Maui. I definitely remember KMC. KMC had a little theater where visitors could go and watch movies that were on the big screen in downtown Honolulu. I remember one night back around 1974 or so, we went to watch a movie called ‘Shark’s Treasure’. We only watched ¾ of it because it was beginning to go into sexual themes and I was only 10 years old. I always wanted to see the rest of it and thirty years later I was finally able to find the movie on the web, so I ordered it and I was finally able to watch the entire movie. It won absolutely nothing and was very poorly made but I was so happy that I found and watched the movie that I missed the ending to 30 years before at that little theater at KMC that summer night back in 1974!!!!!!!!!!!!!! I remember that when we stayed at this certain cabin, I knew it was where General Eisenhower stayed because that particular cabin had a guest registry book and in the beginning of the book Dwight Eisenhower signed it. I believe they copied his signature to this book but it was his signature. How the signature got to that particular guestbook still was questionable but I knew I was in the Eisenhower house back in 1977!! Things have certainly changed in 35+ years but I will never forget the happy times that I spent there in Hawaii!!!!!!!!!!!!!!!!!! !Just a thought…………..
@Michael ~ loved your stories about Hawaii back in the 70s. Thanks for sharing. Funny – that’s my living room furniture. Do you think President Eisenhower and I have the same taste? JK.